The Lady Paladins took advantage of some home course cooking to win the Lady Paladin Invitational. Team members included Coach Jeff Hull, Carly Burkhardt, Mara Burton, Haylee Harford, Jacqueline Bendrick, Natalie Srinivasan. 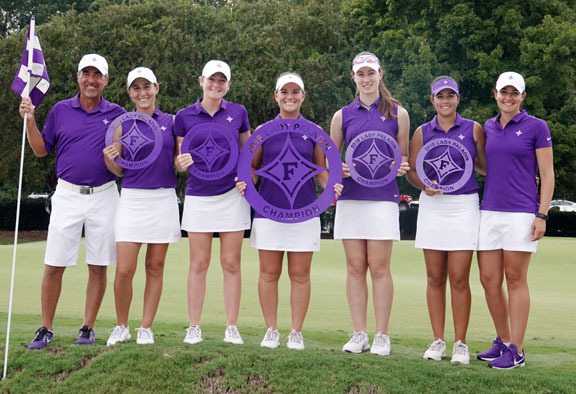 The Furman Lady Paladins are off to another fine start this year. The 11th ranked team has a fourth place finish on the road and a win at home to begin another push to the post season. 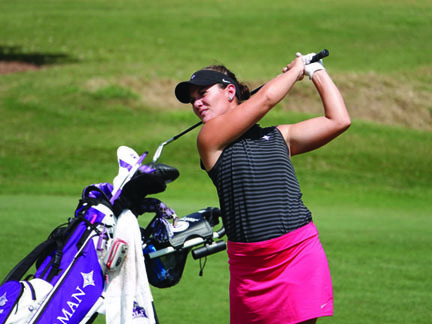 Furman finished fourth in the Cougar Classic at Yeamans Hall. Only Hurricane Florence kept the Lady Paladins from moving up the leader board when the final round was cancelled. Furman finished the season opening tournament in front of a pair of top-15 teams and only trailed 3rd ranked Vanderbilt, 5th ranked Florida and 7th ranked Arkansas. Haylee Harford won her first college tournament with her victory at the Lady Paladin. When Furman hosted the annual Lady Paladin Invitational on their home course, not only did senior Haylee Harford win, the team rolled to an impressive victory. Head coach Jeff Hull has a simple explanation for the past season’s success and a good start to 2018. “We are just good,” said the Furman coach. “We just have good players,” he said with a big smile. Two All-Americans at the top of the lineup followed by a fifth year senior, a one year starter and a lot of new players with outstanding credentials allow Hull to be confident his team can have another successful season. “When you have All- Americans Haylee (Harford) and Natalie (Srinivasan) back and you get a fifth year for senior Jacqueline Bendrick, you just can’t beat that,” said Hull. Add in two years of outstanding recruits who are working their way up to earn playing time and there is every reason for Furman fans to be smiling like their coach. Freshman Kyra Cox finished in a tie for 12th at the Lady Paladin Invitational. “Our newer players got to play in the Lady Paladin and they did very well. We are back to being deep and highly competitive. We are right where we need to be,” he added. At the Cougar Classic, Furman senior Harford and junior Srinivasan tied for third place. 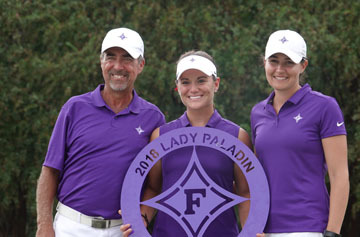 Back home for the Lady Paladin, Harford claimed a two shot win while Srinivasan and Bendrick tied for third place. It was Harford’s first college win and came in her last tournament on her home course. “Last year I was runner-up so I was really striving to win it this year. It is really awesome and I’m glad I was able to do it at home,” said the Lady Paladin winner. Sophomore Caitlin Cotterill, playing as an individual finished in a tie for 6th place. Madison Moosa, also a sophomore individual entrant, finished tied for 12th. True freshman Kyra Cox, also playing as an individual, birdied her first two holes and finished at 3-under par to tie for third in the opening round before falling back into a tie for 12th place at the finish. “You always try to bring in players who can push the veterans and they are right where they need to be now,” said Hull. The Lady Paladins have become a fixture in post season play, but they do not want to take the regular season for granted. Haylee Harford celebrates her win with coaches Jeff Hull and Laura DeMarco. “We use every tournament to gain experience and build for the post-season. You can’t get to the post season without playing well before it,” said Harford. With Carly Burkhardt coming off a medical red shirt year and junior Mara Burton in the lineup with the other veterans, the team has the leadership needed to make it to post season and advance to the final round of eight. “It has been like football. The rankings are so important, so every tournament counts. When the team gets here after the summer they are ready to go and that’s good,” concluded Hull. Furman next plays in the Tar Heel Invitational and in Wilmington, NC at the Landfall Tradition.